LtGen. Eduardo M. Ano AFP, commanding general, Philippine Army tendered with full military honor hosted by MGen. Jet B. Velarmino AFP, commander 8th Infantry Division, Philippine Army during the visit of the former at Headquaters 8ID, PA on February 17, 2016. 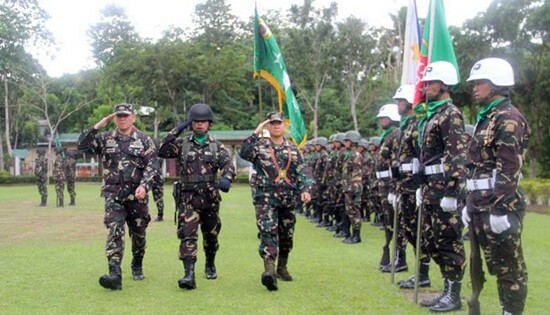 CAMP VICENTE LUKBAN, Catbalogan City – The Philippine Army’s most ranking officer paid his first visit to the home of the 8th Infantry “Stormtroopers” Division, Wednesday. Lt. Gen. Eduardo M. Año, AFP Commanding General, Philippine Army was warmly welcomed by team Stormtroopers through full military honors upon his arrival as part of military tradition. The welcoming party was composed of Maj. Gen. Jet B. Velarmino, Commander, 8ID; Col. Cesar M. Idio, Assistant Division Commander; Col. Divino Rey C. Pabayo Jr., Chief of Staff and the rest of the Stormtroopers’ family. One of the highlights of his visit is the awarding of Gold Cross Medal to the gallant men of Bravo Company, 87th Infantry (Hinirang) Battalion for their successful encounter against the NPA which resulted to the seizure of enemy encampment at Barangay Antol, Calbiga, Samar last December 11, 2015. The heroic quest of Cpt. Nilfe D. Quioco, Cpl. Kith Richard R. Tan and Pvt. 1st Class Grengo O. Decena resulted to the recovery of numerous high powered firearms, ammunition, claymore mines, flat screen television, satellite cable, generator, chainsaw, first aid kit, foodstuff and subversive documents with high intelligence value. In his speech, Lt. Gen. Año reiterated that he will continuously support the 8ID’s efforts in creating a favorable atmosphere sustainable for peace and development in Eastern Visayas. He further commended the Stormtroopers for their enthusiasm in serving its people with highest standard, honor, dedication to duty and their professionalism to contain the insurgent groups while extending humanitarian assistance and disaster during calamities. “I have the fullest confidence in all of you. You have done well and will do even better; I will be fair, just, and supportive. I expect you to be the same. Our people expect no less of all of us, and I know that you will further consecrate yourselves in defending our democracy, and that you will fight to preserve our gains,” said Año. LtCol. 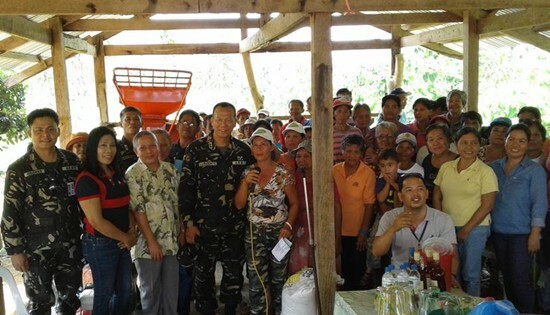 Roberto Sarmiento, commanding officer of the 19th Infantry Battalion, with the Tigbao Farmers Association and Baruguhay Sur Farmers Association of Carigara, Leyte during the Turn-over Ceremony of two (2) corn mill facilities on February 12, 2016. CARIGARA, Leyte – The Department of Labor and Employment (DOLE) turned over two corn mill facilities for the farmers of barangays Tigbao and Baruguhay Sur here on Friday, February 12, 2016. The two corn mill facilities worth P540,000.00 will benefit more or less 200 farmers of Tigbao Farmers Association and Baruguhay Sur Farmers Association including the Municipal farmers Association (MUFAC) Municipality of Carigara. In the Turn-Over Ceremony, Bernardita Navarra, Chief LEO of DOLE Regional Office VIII mentioned that the establishment of the corn mill facilities is the result of the approved project proposal during DOLE and Army partnership in 2015. It can also be recalled that 19th Infantry Battalion and 8th Civil Military Operations Battalion (8CMOBn) achievement during the conduct of Bayanihan Team Activity (BTA) soldiers were proven active partners in bringing the basic and social services closer to the people. Under this scheme, social issues are identified and are subsequently communicated to concerned government agencies for appropriate actions. In his message, Lt. Col. Roberto Sarmiento, Commanding Officer of the 19th Infantry Battalion, “I urged peace stakeholders to join us as we continue to organize and empower communities and indulge on long-term and sustainable solutions to the country’s perennial issue on poverty”, Sarmiento said. Sarmiento expressed his gratitude to DOLE for the immediate implementation of the project, moreover urge the support of all stakeholders to sustain the peace and development as well as economic progress in Carigara. MANILA – Top hotels and restaurants in Manila joined hands with different environmental groups and fisheries NGOs to put their commitment onto the plates by organizing the first-ever Sustainable Seafood Week taking place from February 15 to 21. “Traceability is the core of our Artesmar Yellowfin Fishery Improvement Program for tuna. Fully traceable sourcing, production and delivery procedures ensure that consumers will have access to information around our tuna products – from where our fish was caught to the status of the stock, including the name of fishers. This ensures that the marine environment will not be harmed so we can all enjoy fish, while equitably helping the municipal fishers with profitable livelihood,” said Christian Schmidradner, General Manager of Meliomar Inc. and one of the organizers of the event. MANILA – The Red Cross and Red Crescent Movement has scaled up its humanitarian assistance to tens of thousands of families who have lost their homes and livelihoods after the onslaught of Typhoon Melor (local name: Nona). The typhoon made landfalls over Northern Samar, Sorsogon, Masbate, Romblon, and Oriental Mindoro provinces on 14 and 15 December. According to the National Disaster Risk Reduction and Management Council (NDRRMC), 42 people died while 4 are still missing due to Melor. The typhoon also destroyed 98,371 houses and damaged 181,116 more, with an estimated damage to infrastructure and agriculture amounting to almost P6.5 billion. The accompanying Northeast monsoon also caused widespread flooding and landslides, worsening the situation for many farming communities in Luzon that were still recovering from the impact of Typhoon Koppu last October. During the emergency phase, PRC served ready-to-eat meals to some 19,900 persons in evacuation centres while its social workers provided psychosocial support to 601 people and referral services to persons in evacuation centres through 31 welfare desks. PRC also reached 466 individuals with psychosocial support. As of this February, PRC had reached at least 15,604 families across nine provinces with relief assistance (food packs, safe drinking water, 20-litre jerry cans, sleeping materials, hygiene kits and tarpaulins) in the provinces of Bulacan, Marinduque, Masbate, Occidental Mindoro, Oriental Mindoro, Northern Samar, Pampanga, Romblon and Sorsogon. PRC has also mobilized 872 personnel comprising 136 staff members and 736 volunteers. To support the PRC in monitoring distributions, assessments, and planning for early recovery, the IFRC Country Office has deployed a field delegate, two PMER Officers, and Information Management and Communications support. On December 22, the International Federation of Red Cross and Red Crescent Societies (IFRC) launched an emergency appeal to seek 3.7 million CHF to support the PRC in providing emergency aid to the most affected and most vulnerable families. So far, the IFRC appeal has supported PRC to provide essential emergency relief to 9,000 families. With its current funding, the IFRC appeal will also be able to support a further 1,200 families with shelter repair assistance (SRA) and livelihoods cash grants for 800 families in the next 12 months. In cooperation with the PRC, the International Committee of the Cross (ICRC), working in areas affected by armed conflict, will provide food and livelihood support to some 10,000 affected families in Magallanes, Sorsogon, and Laoang, Biri, Palapag, Mapanas and Catubig municipalities in Northern Samar. At an earlier stage, the ICRC supported the PRC Northern Samar chapter with 2,000 blankets and tarpaulins for 1,000 families, as well as food assistance to 10,000 families. Close coordination is being maintained between the PRC, the IFRC, the ICRC and all Red Cross Red Crescent Movement partners with presence in the Philippines, notably the German Red Cross and the Netherlands Red Cross. Local governments of affected areas are working with the Red Cross regarding strategic planning and operation. Left photo - NMP Tacloban Complex officer-in-charge Atty. Ruben Y. Maceda (second from right) briefs JICA Vice-President Mr. Hiroshi Kato (center) of the grant assistance; Right photo - NMP trainer Mr. Abraham E. Pingol (foremost right) shows Mr. Kato the operationalization of the JICA-donated GMDSS simulator. TACLOBAN CITY – Japan International Cooperation Agency (JICA) Vice-President Mr. Hiroshi Kato, visited today, 9 February 2016, the National Maritime Polytechnic (NMP), a government maritime training and research agency, located at Brgy. Cabalawan, Tacloban City. The purpose is to conduct inspection tour on Japanese government-donated equipment based on the Grant Aid Agreement entered between NMP and JICA for the implementation of the former’s rehabilitation and recovery efforts from Typhoon Yolanda. It is recalled that the grant assistance helped NMP speed up the restoration of its training operations through the provision of state-of-the-art equipment. The donation consist a totally enclosed lifeboat and davit; installation and commissioning of 1 set full mission engine room simulator and 1 set global maritime distress and safety system simulator; a fast rescue boat davit; and various safety equipment. The fast rescue boat is expected to arrive in March 2016. NMP Officer-in-Charge and Chief Administrative Officer Atty. Ruben Y. Maceda apprised the JICA official that the support from the Japanese government to the NMP through technical cooperation programs started in 1984 with the construction of the administration, training and generator buildings. This was followed with the provision of training facilities and equipment, upgrading training for trainers, technical advice in the preparation of trainer's manuals that addressed the new curriculum for adopting the revised Standards of Training, Certification, and Watchkeeping for Seafarers (STCW) International Convention. Further, he informed that to show appreciation of the technical cooperation, an NMP-JICA Friendship Park was established within the agency grounds with a marker that highlights the names of NMP scholars and those of their counterpart trainers in Japan. Ms. Grace Marie T. Ayaso, NMP Head of Maritime Research and Development added that in 2012, the Japanese Government through its Ministry of Land, Infrastructure, Transport and Tourism also collaborated with the Philippine Government through the NMP, Philippine Overseas Employment Administration and then Maritime Training Council in a research undertaking entitled In Their Own Words: Filipino Seafarers’ Experiences of Maritime Piracy. “We have a very long history of cooperation and this is not the end.” Kato said. With the newly-donated equipment, NMP expects to enhance the delivery of quality maritime training courses and the conduct of assessment of competences of Filipino seafarers to upgrade the seafaring expertise of merchant marine officers and ratings. The JICA representatives were welcomed by NMP key officials Atty. Maceda, Ms. Ayaso, Maritime Training and Assessment Head Capt. Emmanuel Jesus M. Laguitan and maritime training specialists Engr. Ponciano V. Trinidad, Engr. Claro L. Coscos and Abraham E. Pingol. In its effort to contribute in providing employment to Filipino seafarers, NMP continues to upgrade its facilities and provide quality maritime trainings required pursuant to the STCW Convention as amended in 2010. 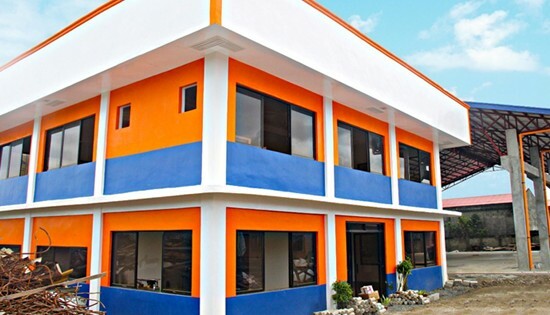 Newly constructed Multi-Purpose Building (Quality Assurance Building) in Samar First DEO. CALBAYOG CITY – An effective and efficient workplace demands to be organized and well-structured. Department of Public Works and Highways - Samar First District Engineering Office (DPWH-SFDEO) for one believes in this maxim. In fact, since relocating from Barangay Hamorawon, Calbayog City to Barangay San Policarpo, Calbayog City in July of 2010, Samar I DEO has been continuously improving its new working environment. Recent Infrastructure Programs paved the way to four additional projects which could significantly improve the working environment of Samar I’s DEO. To wit: construction of two multi-purpose buildings, repair of DPWH parking space and repair/rehabilitation/improvement of motorpool building. With an appropriation of seven million pesos (P7,000,000.00) one of the MPB was under contract with ADB Dynamic Builders. This MPB is a two storey 12m x 12m building with a 65 meter drainage and 20 meters length concrete pathway which is 1.50 meters wide. The second MPB was under contract with JFR Construction and has an appropriation of six million nine hundred fifty pesos (P6,950,000.00). Said MPB is 17m x 30m with canal linings. On January 28, 2016, both of these MPBs were inaugurated. The event was graced by DILG Secretary Mel Senen Sarmiento, his brother Engr. Edgar Mary Sarmiento and Rev. Fr. Jonathan Zeta with the later spearheading the blessing of both MPBs. The Materials Section of SFDEO is now occupying the first MPB. Commenced the latter part of 2015, the repair of DPWH parking space ensures safekeeping of service vehicles. The project which has an appropriation of one hundred thirty one thousand pesos (P131,000.00) includes roofing works. Also scheduled is the repair/rehabilitation/improvement of motorpool building. The motorpool project has an appropriation of three million one hundred ninety seven thousand pesos (P3,197,000.00) and is under contract with VCD Construction. As of this writing, the project is still on going. As Samar I continues to develop, we can expect that SFDEO staff likewise will continue to grow in number. That being said, we can also expect for SFDEO to improve/increase its own infrastructures to cater the proportional demand for an ameliorated workplace. New requirements put members at risk as parameters on treatment are set. QUEZON CITY – The group Health Alliance for Democracy (HEAD) strongly condemned two recently released circulars by the Philippine Health Insurance Corporation (PhilHealth) as arbitrary and anti-patient/anti-member. PhilHealth Circulars 2016-001 and 002 or the Policy Statement on the Diagnosis and Management of Acute Gastroenteritis and Urinary Tract Infection, respectively, require a minimum hospital stay of 3 days for AGE and 4 days for uncomplicated UTI. Otherwise, claims will be denied. “Since when did it become PhilHealth’s role to determine and set limits to the diagnosis and management of patients?” decried Dr. Joseph Carabeo, HEAD secretary-general. “A health financing agency, a state-run one at that, should not in any influence patient care. PhilHealth is now acting like a private HMO (health maintenance organization) that dictates the quality of care for its members.” In the United States, HMOs are notorious for interfering with patient care. 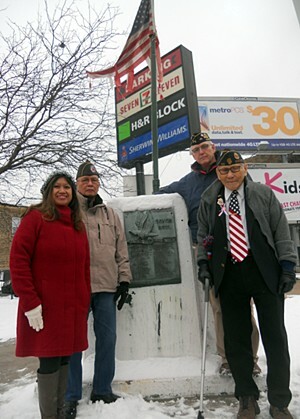 CHICAGO – On December 30, 2015, in honor of our national hero Dr. Jose Rizal, while challenging the inclement weather conditions, the WWII Filipino veterans of Illinois volunteered to remove a tattered American Flag with a new one they donated. Filvets with the tattered American flag before replacing with a new one. Americas "Old Glory" was half shredded and still entangled in tree branches, the other half that was left of her still flying in pieces over a small veteran's memorial dedicated with names of the fallen during the Global War inscribed on a bronze "Honor Roll" plaque by those residing in a community. These same WWII Filipino veterans renewed the task only years ago, to again bring public awareness to three church bells and cannon removed by the US Army in 1901 from the Town of Balangiga in Eastern Samar. This has been a difficult mission for Filipino communities because of the lack of support by elected officials of the Philippine government to request a formal inquiry. In the US, we are uncertain if orders to suppress the church bell campaign had been issued to our local office of the Philippine Consulate General of Chicago via Ambassador Cuisia or by the Department of Foreign Affairs, Secretary Albert del Rosario. One thing is for certain, for the entire 365 days approximately one hour on April 9, is set aside by staff representatives of the Philippine Consulate General of Chicago, to pass out donated brown bag snacks here in Chicago for these aging WWII veterans. It was requested in advance to invite these WWII Filipino veterans during President Aquino's visit here on May 2015, to demonstrate the Philippines stead-fast support for their on-going, continued efforts in the community. Failure to take action with these early decisions by someone within the Chicago's Consulate General, should result in disciplinary review for those foreign career service diplomats involved. QUEZON CITY – Today, a coalition made up of over 40 national and local organizations launched the Green Thumb Coalition and challenged 2016 presidential candidates to put socio-environmental issues at the heart of their electoral platforms. ABS-CBN Lingkod Kapamilya Foundation, Inc. Chairman Gina Lopez, Greenpeace Southeast Asia Executive Director Naderev “Yeb” Saño, Alyansa Tigil Mina Head Jaybee Garganera, Convenor for the Center for Energy, Ecology and Development (CEED) Gerry Arances, SANLAKAS Representative Atty. Aaron Pedrosa. SANLAKAS presented the coalition’s plan of action which was inspired by the member coalition’s previous campaigns on issues such as climate change, waste management, working for indigenous people’s rights.